You can see how much cleaner things look now that we have removed the pillar bushes and concrete. 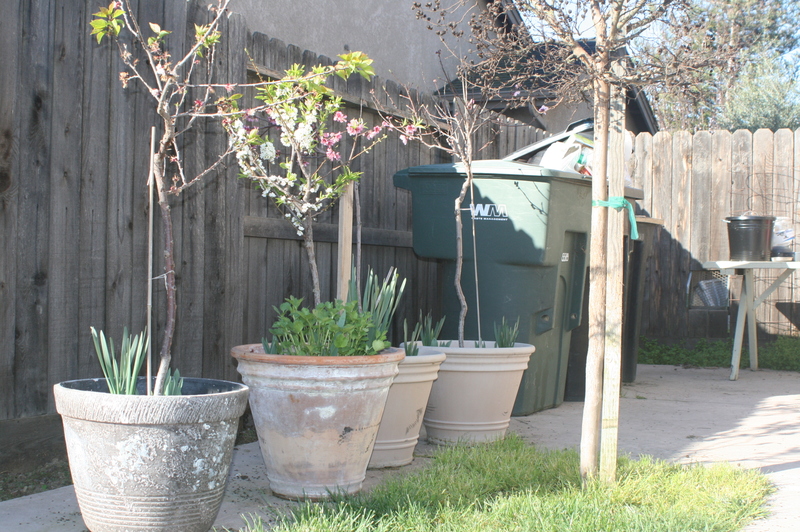 Once the fence is in we’ll plant these fruit trees in the yard. 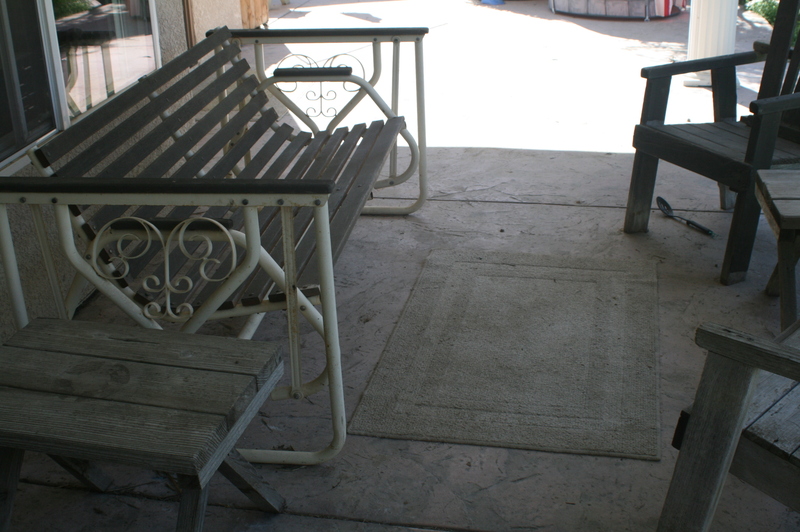 We’ll rebuild an old bench to place out there as well. We chose to leave one concrete strip to use a “stroller access” for walks. Otherwise we would have to go the long way down the drive way. The front walk way has steps. 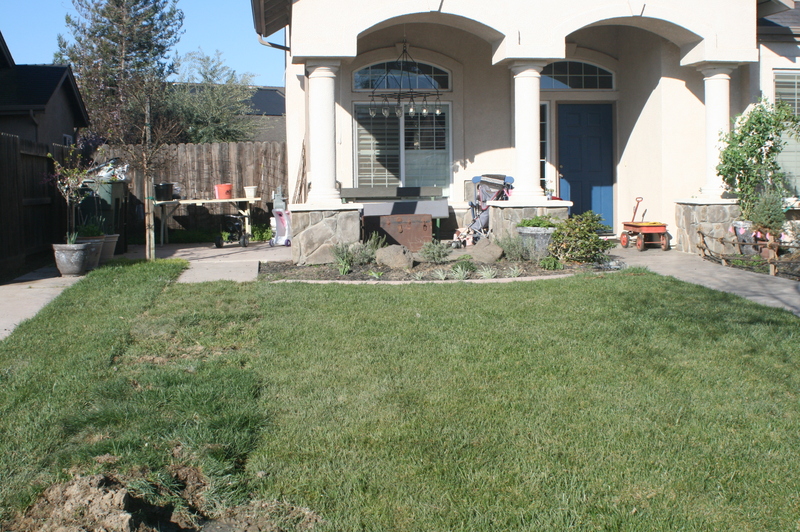 For plants in the front, the area you saw in the photos above will have flowers and herbs (rosemary, lavender). To the right (not pictured) will be our vegetable garden. It has the best light and the children do not play out front without supervision, so its safer for the plants. I have not shown you photos of our backyard. It’s never been an eye-sore or anything, but I’ve never liked it. When we moved in, the back was overgrown with weeds. The timer for the sprinklers was missing and a valve is loose. In order to water the yard and turn the sprinklers off, my husband had to engage in an elaborate routine that ends in a rain dance. 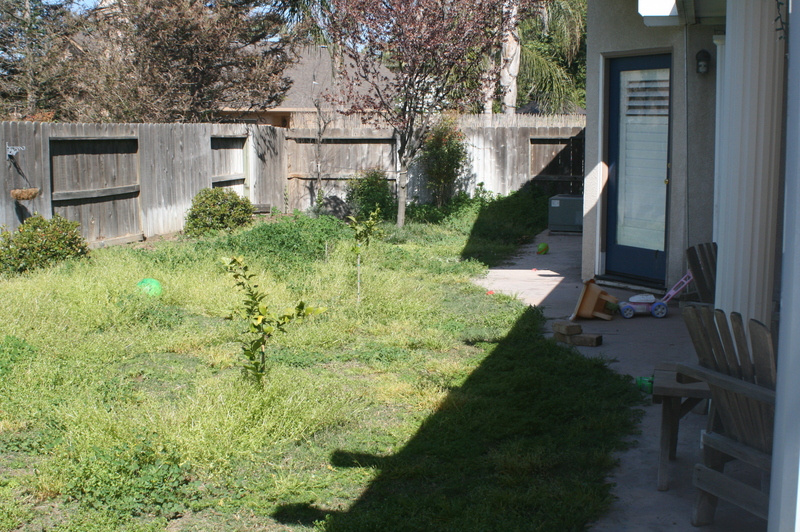 So we decided to let the weed-lawn die and plan for the future. I’m traditional, but non-traditional in some respects. This might make me a hipster traditionalist. I suspect those who know me would be lolling right now (that “laugh out louding”). 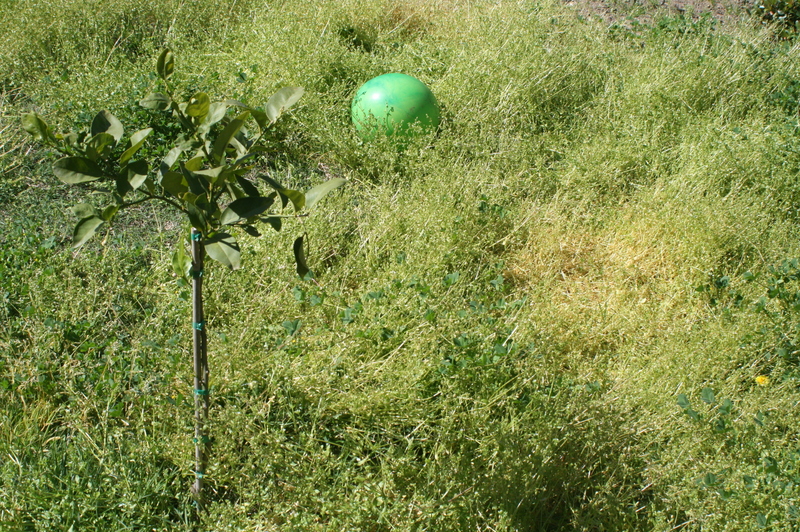 Nevertheless, who says you have to have grass? We contemplated other options. Winter came. A little rain came. The idea came: let’s make it a meadow. I think it’s pretty. We pick out the weeds we don’t like (dandelions, anything prickly) and are “cultivating” the pretty weeds. My husband threw down chia seeds in the bare spots (so hip!). 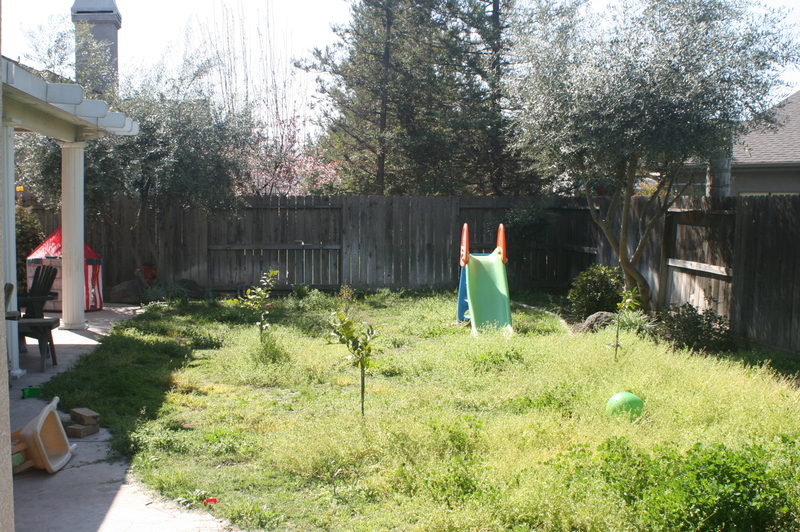 My mom can’t wrap her mind around it, but we’ll mow soon to clean it up and plant wildflowers along the sides. If we get the sprinklers working, I think we can keep the green levels up and enjoy this drought friendly, grass alternative. I think the fence needs some sprucing. Summer project, perhaps. We have a covered area in the backyard that looks like this. 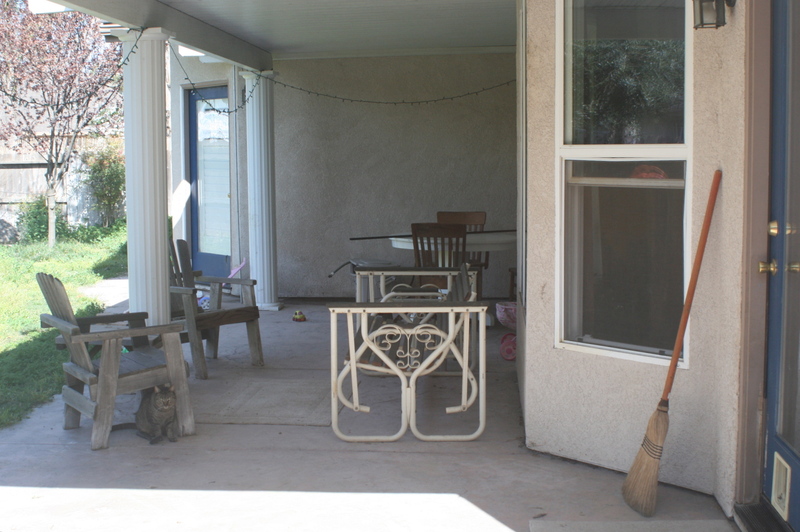 The pillars are in awkward spots, and outside the bay window it is a little narrow, but we have a sitting area in the narrow section with a swing bench and broken down redwood chairs. At this point, everything is hand-me-down furniture. One day we’ll have something comfy outdoors. My great-grandmother’s sits in a deeper section of the covered area with three spare chairs that are drying out from the temperature changes. I plan to send these back to my parents house (via our van) and getting those soon-to-be-painted metal chairs out there. We’ll start eating out once we have the energy to think about it. There is a paved area around the corner, for the RV of course (watch out for the solid wood fence when you drive up). I have used this area for a clothesline, which we just replaced with something neater on a post, which I purchased from Target. An adjustment, but a good purchase so far. 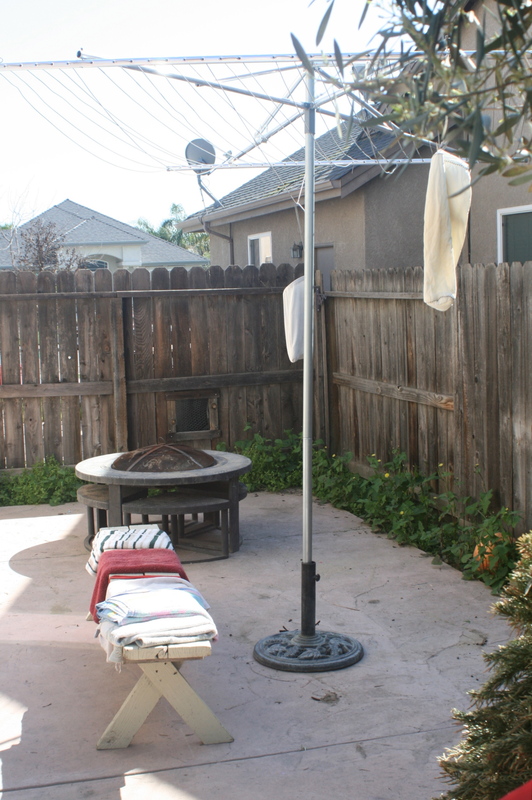 The fire pit has a better home out there by the clotheslines (not to be used at the same time). For too long it was right outside the back door. 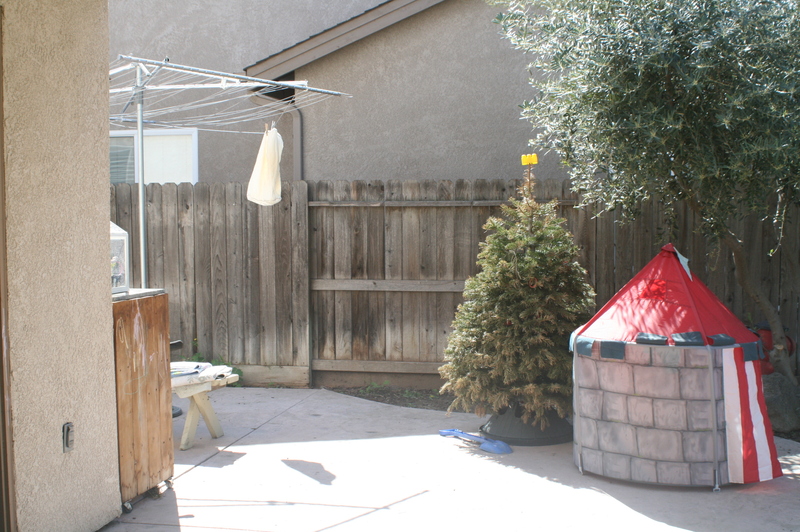 So you don’t become too dazzled by my backyard (she wrote, tongue in cheek), I will show you a picture of our Christmas tree (this photograph taken the first week of March). My husband put it outside for the kids to play with, since we had to work so hard to get them not to play with it at Christmas-time. As it goes with most thoughtful playthings, it has sat, largely ignored, except for a lego tree-topper. It’s amazing how long the tree lasted. The plan for the backyard has come much slower. I’m happy with our “meadow” plan and the wild flower plan. I’d like to grow some lilies and hydrangeas in the shadier corner of the yard. I just read hydrangeas are highly toxic if ingested (we have an ingesting-type of son), so this plan will require more discussion.